Replacing old patio doors can open up your home to more light and ventilation. In some cases, you may enjoy greater comfort by upgrading old patio doors to more energy efficient ones. One of the most important aspects of choosing a replacement door is the operation style. Choose between In-Swing, Out-Swing or Sliding patio doors to best fit your space. In-swing - The hinges are located inside the home and not visible to the outside. You need adequate space on the interior of the door to accommodate the swing space. Out-swing – Out-swing patio doors needs a clear path on the outside. Hurricane doors and doors in high wind areas are often out-swing because of the greater strength it provides when the wind is pushing against the doors. 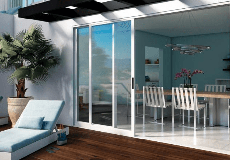 Sliding – Sliding patio doors are a good solution in spaces that simply cannot accommodate a full swinging door such as a balcony or sunroom. All Milgard patio doors are custom made to fit your existing opening so you don’t need to worry about finding an existing size to fit. The first thing you would do is measure your entrance space. Make sure you assess the condition of the opening. Look for structural or weather issues on the surrounding wall space. It is important to complete any needed repairs before proceeding with the window replacement project. Replacement patio doors are installed using a block frame or z-bar, which does not require access to exposed studs. This means there is less removal of exterior materials such as siding and trim. In a replacement project, the installer can remove the entire frame of the old patio door or leave in the jambs and cut out the sill. If you are not sure about your options, talk with your project supervisor or get in touch with a local Milgard dealer.